Bhai Manjit Singh aka Museebat Singh was born in 1956 and was one of 3 brothers, with elder brother Bhai Darshan Singh and younger brother Bhai Surinder Singh (Ragi). Bhai Manjit Singh studied till Metric at a school run by the management of Khalsa College and during this period took Amrit at Khalsa College. Around 1978-1979 Bhai Manjit Singh was wed to Bibi Sharanjeet Kaur but continued in his active role of sewa along with taking care of his household duties. In the late 70’s and early 80’s a new Sikh leader and SaintSoldier by the name of Sant Jarnail Singh Khalsa Bhindranwale had taken Punjab by storm, thousands of Sikhs travelled across Punjab for glimpses of the warrior and to listen to his soul awakening speeches. Bhai Manjit Singh was one of these thousands. Subsequent to meeting Sant Ji, Bhai Manjit Singh came home and expressed his delight and stated that he had finally found what he had been looking for, having been blessed by Sant Ji, Bhai Manjit Singh had a purpose in life – to protect the honour of the Sikh faith. From then on Bhai Manjit Singh visited Sri Darbar Sahib daily to listen to Sant Jarnail Singh’s speeches. One day, Bhai Manjit had told his family that he was leaving to visit Sri Hazoor Sahib. On August 20, 1982 news began to circulate that in protest to the Governments harsh treatment towards the Sikhs, Bhai Manjit Singh had hijacked a plane leaving from Udaipur to Delhi. “Around mid-morning there was commotion in the area that Museebat Singh had hijacked a plane. The immediate thought running through my mind was could this be our Manjit Singh? By evening the news had been confirmed and with the rest of the family I reached Sri Darbar Sahib hoping to meet Sant Jarnail Singh. Mata Kartar Kaur revealed that Bhai Manjit Singh had initially planned on taking the plane to Libya, however was told by the pilot that the plane did not carry enough fuel to do so. 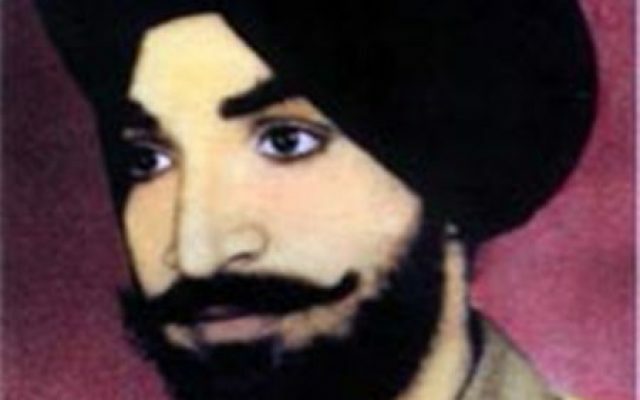 Then Bhai Manjit Singh instructed the pilot to take the plane to Lahore, but the plane was not permitted to land as the Indian Government had already lodged protest with Pakistan. The plane circled above Pakistan for some time until eventually they returned back and landed at Raja Sansi Airport, Amritsar with the intention of refuelling. Whilst landed at Raja Sansi airport Bhai Manjit Singh released many of the passengers aboard before giving himself up on assurances that he would not be harmed. However, as Bhai Manjit Singh came out of the plane he was shot at a point blank range by DSP Bachan Singh. Khalsa Ji: a lady born to a house of Pundits, having got the votes of the people, became Prime Minister of India. This is Bibi (lady) Indira Gandhi. In 1977, according to her deeds, a judge of the Supreme Court sentenced her to a few days in prison. To serve this sentence she went to Tihar Jail. Nobody slapped her, she had no wounds. No one used any disrespectful word. A judge had sentenced her. But her colleagues, Pandey and others hijacked a plane to protest their Bibi having been sent to prison. What was the punishment given (to them) for this hijacking? They were given tickets for becoming members of the Legislative Assembly, one in U.P. (Uttar Pradesh) and the other in Bihar. On the other hand, on September 14, (1981) in Chando-Kalan, two busses belonging to the Jatha (Sant Bhindranwale’s group) with copies of Sahib Satguru Sri Guru Granth Sahib Ji in them, were doused with kerosene and set on fire by government officials including Bhatti (a police official) and some others like him. After that, on September 20, (1981), in Chowk Mehta, I offered myself for arrest after offering prayers to the Guru in the presence of the Congregation. The entire Panth, (including various) associations and organizations, had assembled there. In spite of my surrendering peacefully, Khalsa Ji, one and one-half dozen Singhs, our turbaned Sikhs, were put to death (by the police). When the young men of the (Sikh) Nation did not find any redress or justice coming from any quarter, in order to do what they could to direct the attention of the entire public and the government to this atrocity, to point out what the government had been doing to the Sikhs, they hijacked a plane. These five Sikhs, Gajinder Singh and others, who are in Pakistan, have been exiled. In addition it was said: “These persons are our accused, our criminals, they should be handed over to us, we have to sentence them to death.” If a plane is hijacked for the sake of a lady of the Pundits, there is the chair (public office), but if a plane is hijacked for the Beloved (Guru) of the Sikhs there is exile! Hijacking a plane for a lady of the Pundits is patriotism, but, if a Sikh hijacked a plane to protest (the treatment of) his Beloved (Siri Guru Granth Sahib), Manjit Singh was shot to death at Raja Sansi airport on August 20, (1982). This is an evident sign of slavery. Pandey and associates did not damage the plane nor did they hurt any passengers. Nor did these Sikhs, in all three hijackings, harrass any passenger or damage any planes. But, what is the rule? For a fellow with a turban, there is the bullet, there is the crippling injection, and there is exile. However, if one says “Hare Krishna, Hare Krishna, Hare Rama, Hare Rama,” there is the chair (appointment to high office). This is a sign of slavery, Khalsa Ji. Mata Kartar Kaur remained at Guru Nanak Niwas for almost a year, before returning home for the Sri Akhand Path Sahib for Bhai Manjit Singh. In June 1984, when the Indian army attacked Sri Darbar Sahib, Mata Kartar Kaur and Bhai Surinder Singh were both inside the complex. Mata Kartar Kaur was kept imprisoned for 3 months then sent to Ludhiana prison for a further 3 months. Mata Ji still remembers the days when Baba Thakur Singh Ji would visit the prisoners in B-Block. The Singhs would tell Baba Thakur Singh that Mata Ji is mother of Bhai Museebat Singh then Baba Ji would stand up in respect of Mata Ji. Mata Ji also commented on the present state of Mehta Chowk and how the presence of Baba Thakur Singh is deeply missed. Now, left with just their memories, Mata Ji continues to live life in less than glorious conditions, but within the will of Satguru.